This is the first wire gold specimen that I have ever seen come out of Oregon. 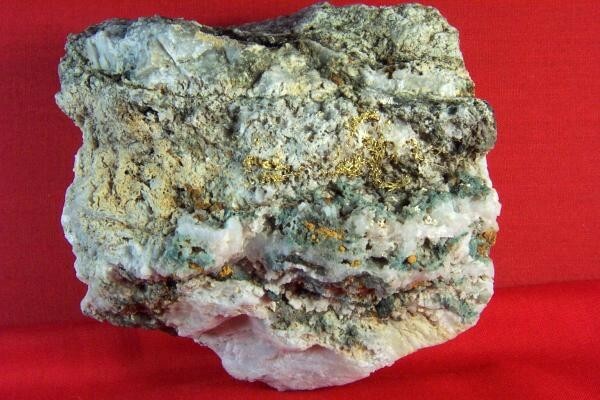 It is a huge gold specimen weighing in at 630 Grams (20.27 Troy Ounces) and the size is 3.5" x 3.5" x 2". 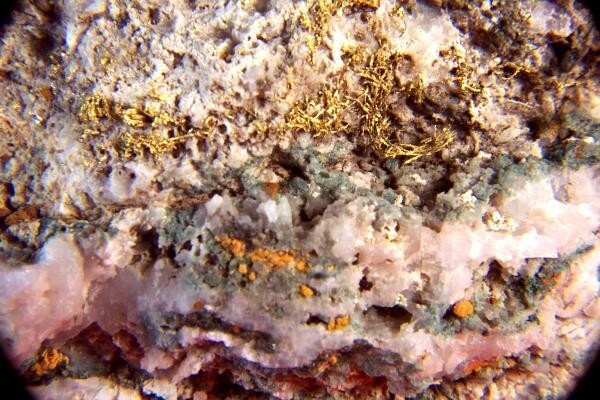 It has some very spectacular gold wires sitting on the surface of very attractive multi colored quartz/calcite. Therse is more crystalline gold inclusions in the quartz as well as the gold wires. It comes from Canyon City in Grant County, Oregon. A huge gold specimen from such a rare location with super rare gold wires in rarely seen for sale. This one is priced to sell quickly so get it while you can. This is another rare gold specimen that belongs in a museum due to it's size and rarity. And you have a rare opportunity to own it for your private collection.